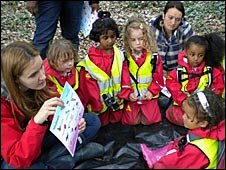 The Forest School helps to tackle the urban "nature deficit"
How many three year olds wouldn't want to get muddy by jumping in a puddle? Or how many wouldn't want to roll down a hill? But if an inner-city child is not introduced to a natural environment in early life, they may miss out on such activities, or even be scared to try them. 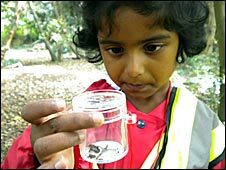 Deep in woodland in Roehampton, south west London, a group of three and four year olds are now accustomed to picking up bugs, traipsing through woods and getting dirty. Their nursery - Eastwood Centre - is part of the Forest School movement, which provides school sessions out in the natural world around their home. Katherine Milchem is the Forest School co-ordinator at Eastwood, and says some of the children needed encouragement at first. "Some kids were petrified of getting dirty and muddy in the beginning." "I've heard it spoken about as a 'nature deficit' in their lives." The forest session begins by getting dressed in red boiler suits and luminous jackets for visibility. The staff lead them into the woodland in Froegel Park, part of the Roehampton University site. Each child is given a "bug bubble"
There, the children are reminded of how they must respect the surroundings. "If we pick all the flowers, none of the animals will have their food," says Emily. With a little prompting, she remembers that bees and butterflies might be affected if flowers are removed. There are activities for the children when they arrive at a suitable spot in the woodland, which can be adapted according to what the children feel like on the day. This session sees the children taking an interest in animals and any plans for arts or crafts are left for another day. But not before they have found some muddy puddles to jump around in. Some children are still a little reluctant. One doesn't want to jump in the puddle in case she kills a baby toad she saw in a puddle last time. Several children take up the idea and go looking for baby toads - and the rest follow suit. Katherine Milchem captures two toads and puts them in a bucket for the children to inspect, and one has the task of keeping them safe for the rest of the trip. Forest Schools are beginning to increase their presence in urban areas, having been used in rural areas across Britain since the 1990s. The idea was originally developed in 1995 by educationalists at Bridgewater College in Somerset, who drew on the Scandinavian model of Nature Kindergartens, and still train most Forest School leaders. 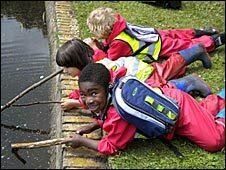 Forest Schools can now be found in Birmingham, and several south London boroughs, as well as 20 other regions in England, Scotland and Wales. Eastwood Nursery centre took on the Forest School idea in 2006 and Katherine Milchem says it has benefited children of all ages and stages of development. The local area has some deprived estates, and the London borough of Wandsworth has a relatively high level of obesity. A considerable number of the children at the centre have special needs such as language delay, or autistic spectrum disorder. 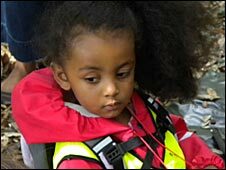 Three-year-old Alisha is now beginning to say a few words in front of other children but still talks more freely at home, according to her parents who joined in the session. Her mother Davina says today has been a good day - Alisha's mixing in. "She's becoming more confident and is learning a lot," Davina says. "For example she's been learning about the different seasons because the children have been going out for quite a while now," adds father Ian. "And that's not necessarily the type of thing we would have talked about at home," says Davina. Parents enjoy themselves too - though one big, burly dad in the group cannot bear to touch any beetles or bugs, leaving this to his three-year-old daughter. It is not hard to see why some of these city children are also a little timid around nature at first. "It's important to introduce natural spaces for play and learning in childhood so that this can be continued into adulthood," says Katherine Milchem. However, it is not just about learning the names of beetles and bugs or trees, she says, but about emotional development, confidence, empathy and getting on with others. "There's some research to back up the idea that children who learn to care for animals are more likely to take responsibility for themselves in adult life. "And they learn to assess risk too - what they can and cannot do," she says. The staff, led by Katherine, have had the children using hack saws and secateurs, working with wood from the local elder trees and building a house in which to collect insects and learn more about the local habitat. On the way home, Emily wants to carry the toads, but before she is allowed, Katherine asks her to explain why they must be put back where they were found. "How will they feel if we don't take them back to their house?" "They might hop away..." replies Emily. "And they might be sad."